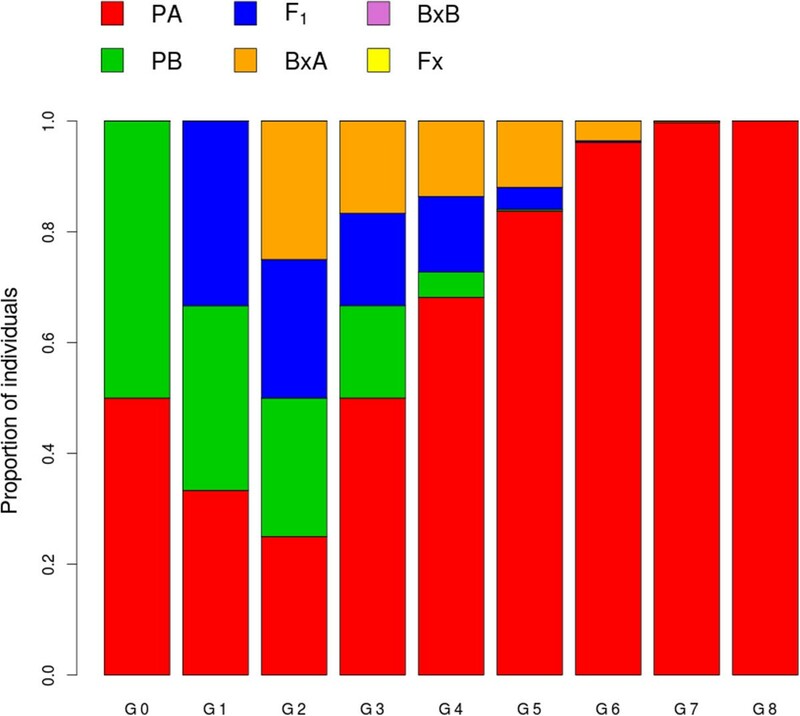 In spite of a large diversity of approaches to investigate loci under selection from a population genetic perspective, very few programs have been specifically designed to date to test selection in hybrids using dominant markers. In addition, simulators of dominant markers are very scarce and they do not usually take into account hybridization. Here, we present a new, multifunctional, R package for dominant genetic markers, AFLPsim. This package can simulate dominant markers in hybridizing populations and implements genome scan methods for detecting outlier dominant loci in hybrids. In addition, it includes tools for further manipulating the results, plotting them and other tasks. We describe and tabulate the major functions implemented in AFLPsim. In addition, we provide some demonstration of its use and we perform a comparative study with other software. Finally, we conclude by briefly describing the input and output formats. The R package AFLPsim application provides several useful tools in the context of hybridization studies. It can simulate dominant markers in hybridizing populations and predict their demographic evolution. In addition, we implement a new genome scan method for detecting outlier dominant loci in hybrids, which shows a rather high sensitivity and is very conservative in comparison with Gagnaire et al.’s, Bayescan and introgress. The application is downloadable at http://cran.r-project.org/web/packages/AFLPsim/. The study of natural hybridization has been the focus of much attention in Evolutionary Biology [1, 2]. Hybridization has recently been perceived as a catalyst not only for speciation but also for major evolutionary innovations . Hybrid zones offer a “window on the evolutionary process” involving divergence at many loci by a balance between dispersal and selection . Cline theory has provided a conceptual framework to understand the forces maintaining hybrid zones and to help infer the relevant evolutionary parameters describing the introgression of traits across hybrid zones . However, in non-stable hybrid zones, selection in early generations has a central role in the establishment and fate of hybrids and progenitors [1, 4]. In these early generations, several hybrid categories can be easily distinguished (first generation hybrids –F1–, outcrosses between F1 individuals –F2–, or backcrosses to parental “A” –BxA– and backcrosses to parental “B” –BxB–, for instance). Hence, identifying markers under selection on these early-generated hybrids can provide tremendous knowledge about the stability of hybrid zones. Although next generation sequencing (NGS) has transformed our ability to identify the genes underpinning selection/adaptation , a complementary approach with potentially neutral markers such as Amplified Fragment Length Polymorphisms (AFLPs) allows a cost-effective screening of the genomes of a large number of individuals . AFLP has been very successfully used in the identification of hybrids [8, 9] and outlier loci presumably under selection [10–12]. However, in spite of a large diversity of approaches to investigate loci under selection from a population genetic perspective [13–15], no program has been specifically designed to date to test selection in hybrids using dominant markers. Nevertheless, genomic clines have been used to identify molecular markers with patterns of introgression inconsistent with neutrality (e.g. introgress[16, 17]). However, detecting outliers in a hybridizing framework using dominant markers can be a real challenge. Long periods of time are needed to identify loci that have experienced a history of weak selection, as cumulative effect is necessary to produce a detectable signal in the DNA polymorphism of the underlying loci . Therefore, for hybrids in early generations, loci under weak selection would remain undetectable. In addition, dominance imposes difficulties to estimate allelic frequencies, especially when the frequency of the presence-allele is high . Scoring errors and a low sample size can also affect the correct estimate of the allelic frequencies. Furthermore, previous methods used to detect dominant loci under selection have shown a substantial proportion of false positives among the detected outliers . Hence, genome scan in hybrid zones should be capable to correctly estimate expected allelic frequencies under neutrality in hybrids overcoming these problems. Moreover, it should be sensitive enough to detect loci under moderate selection as well as keeping the false positive rate close to null. Additionally, being able to simulate dominant markers in a hybrid zone is important to obtain a better knowledge about expected patterns of hybridization. When experimental treatments are not feasible, in-silico simulations have been widely used to test population genetic hypotheses . Furthermore, genetic simulations have been also used to understand the statistical efficiency of several genetic methods and to compare different approaches . Finally, simulations are of practical use when analysing data from a real system, as they can compare observed genetic distributions with the theoretically expected ones. In spite of its importance, simulators of dominant markers are very scarce  and they do not usually take into account hybridization, but see . Again, dominance of markers is one of the major problems in the simulation process, as allele frequencies have to be estimated from phenotypic data. Here, we describe AFLPsim, a software package designed to overcome these limitations by implementing a dominant marker simulator of hybridization and two genome scan algorithms (Gagnaire et al.’s  and a new method called bal&gar-ca) specifically designed to detect outlier markers in recent generated hybrids (F1, F2, BxA and BxB). The software is written in a statistical, open source, scripting R language , and released under the GPL license to guarantee the continuing availability of the source code. A list of the major functions in the AFLPsim library is shown in Table 1. These functions cover methods in simulation, genome scan, and manipulation and visualization of results, which are detailed below. More details can be found in the software manual, which is available at https://github.com/fbalao/AFLPsim. conducts demographic analysis in hybrid populations. generates multilocus dominant hybrids individuals from parental profiles. generates multilocus dominant parental and hybrid individuals. calls Bayescan 2.1 program  from R to a set of populations. conducts genome scan on F1 and backcross individuals . estimates the hybrid index calling the introgress package. plots phenotypic frequencies of hybrids on a neutral hybridization model. plots results of ‘demosimhybrid’ function. converts simulation to the genind format . writes the input file for Arlequin from the simulation results. writes the input file for Bayescan from the simulation results. writes the input file for Popgene from the simulation results. converts simulation to the introgress format . writes the input file for Newhybrids from the simulation results. writes the input file for Structure from the simulation results. and pB is the frequency of the presence-allele in the parental population B ( p B = 1 - 1 - frequency of the band ). Users can choose both the intensity of this coefficient (s) and the number of markers under selection. The interplay of genetic and ecological processes often has important effects on the fate of the hybrid zones. Models can be powerful tools for investigating different control scenarios before undertaking expensive field trials. Plenty of mathematical models describing the dynamics and genetics of hybridization have been widely used. Briefly, these are categorised as ecological or genetic models. The advantages and disadvantages of these diverse approaches have been discussed in detail  and the utility of each model depends on the scenario and the supporting data. We implement a modified version of the genetic model of demographic evolution in hybrid zones (‘demosimhybrid’) developed by Epifanio & Philipp . This heuristic model simulates the proportion of parentals, F1, Fx and backcrosses (with both parentals) individuals for each generation. The contribution of each taxon following admixture and hybridization depends on three independent variables: (1) the initial proportion of parental taxa; (2) the fitness gradient among parental and hybrid taxa; and, (3) the assortative mating between these taxa. Composition at any time (t, in generations) is calculated by multiplying its initial abundance by its relative fitness, and then, by the probability of mating, using the general equations 6 & 7.
where M is the assortative mating matrix. Epifanio & Philipp’s model suffers from several pitfalls, e.g. migration is not taken into account and it is not spatially explicit [26, 28]. However, it has been successfully used to explain the extinction of progenitors in several hybrids zones [28, 29]. where f O F 1 is the observed frequency of band presence at one locus, n F 1 is the number of F1 hybrids and f F 1 is the expected frequency of band presence at that locus. Using this method, some fragments could appear to be under selection when in fact they are not (i.e. false positives), because the observed parental frequencies (f A and f B ) can be biased by sampling error. For this reason, we implement a more conservative method (bal&gar-ca) calculating parental frequencies for each marker through √(1 - α) confidence intervals (in this case, α = 0.05) by the Clopper-Pearson ‘exact’ procedure, which is based on a beta distribution . Every combination of one interval end from one parental and one interval end from the other parental lead to an expected value within the neutral expectation surface, and the four values delimit a 1 - α probability portion of it. If it is within the two most extreme values, we conclude the fragment is not under selection (i.e. P f O F 1 = f F 1 = 1 ). If not, we choose the closest of the four frequencies to be the expected value of the binomial test. In both methods, the False Discovery Rate (FDR) correction is used to counteract for multiple comparisons and control for the expected proportion of the incorrectly rejected null hypotheses. In addition, we also include a function that calls the Bayescan program  from R to perform a Bayesian estimation of selection; in this way, we facilitate the analysis and plotting of results of this efficient software. Moreover, the hybrid index (i.e. the genome-wide admixture) for the simulated hybrid individuals is calculated with the ‘hybridindex’ function. The maximum likelihood estimates (together with the 95% confidence intervals) of this hybrid index can be obtained with this function, which is a wrapper for the ‘est.h’ function of the package introgress. AFLPsim functions do not require external input files out of the R environment (Table 1). However, for the simulation of hybrids from user-specified parental data, these should be loaded to R as a matrix or a data.frame. Simulation results can be readily used by multivariate and phylogenetic methods of other R packages (e.g. ade4; adegenet). Our package is also able to export Arlequin formatted data  and Popgene to estimate summary statistics (e.g. F-statistics, Shannon index or polymorphic loci) from the data set. Our package is also able to export data formatted for several popular population genetic computer programs such as Structure and Newhybrids. In addition, AFLPsim contains functions that produce graphics for visualising the expected frequencies under neutrality for loci under selection across the different hybrid classes. Finally, our package includes a function that plots the results of the demographic evolution model in a hybrid zone. To demonstrate the capacities of AFLPsim, we assessed some comparisons on the behaviour of our genome scan method vs. that of other software. We have also created several illustrative examples, which can be easily reproduced. An example of the application of AFLPsim for investigating introgression patterns (bal&gar-ca method) and demographic dynamics (Epifanio & Philipp’s model) in a hybrid zone can be found in . We investigated the performance of our method (bal&gar-ca) under different scenarios using a simulation study and its efficiency was compared with that of Gagnaire et al.’s, Bayescan and introgress. Although Bayescan is not specifically designed for hybrids, we used it for comparison, as it is one of the most popular genome scan software. In this case, we used both parentals and F1 hybrids as three independent populations. introgress has been used to explore introgression between genomes through the genomic cline method. This method is able to identify those molecular markers with introgression patterns inconsistent with neutrality and, therefore, detecting possible loci under selection. 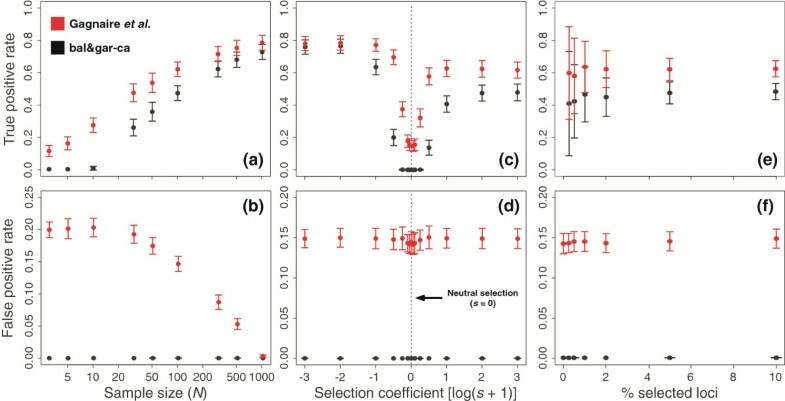 We performed three different simulation experiments to compare the outlier detection efficiency of different genome scan methods, different selection coefficients, different sample sizes and different percentage of selected loci in the genome. We carried out all the simulations on the University of Oslo Bioportal (http://www.bioportal.uio.no) using the ‘hybridsim’ function. We compared the results obtained with four methods (bal&gar-ca, Gagnaire et al.’s, introgress and Bayescan), with three selection coefficients (s = 2.162, log (s + 1) = 0.5, weak selection; s = 99, log (s + 1) = 2, strong selection; s = 999, log (s + 1) = 3, very strong selection). 100 F1 hybrid individuals were simulated with ‘hybridsim’ from two parental populations (A and B) of 100 individuals each one. We simulated 1000 independent loci (i.e. based on linkage disequilibrium), where 100 were introgressed under directional selection in the F1. Every scenario (i.e. every selection coefficient) was replicated 100 times. Genome scans were performed on simulations with our method (bal&gar-ca), that by Gagnaire et al., introgress and Bayescan 2.1, assessing the ability of each one for detecting selection of different intensities as well as the proportion of failures as false positives. Results showed, on the one hand, that our method was very conservative and that its sensitivity (i.e., the rate of true positives) was lower than that by Gagnaire et al. and introgress; on the other hand, Bayescan almost invariably failed to detect outliers for the simulated datasets (Table 2). However, our method had a null false positive rate unlike Gagnaire et al.’s and introgress (~15% and ~13% false outlier detection, respectively). 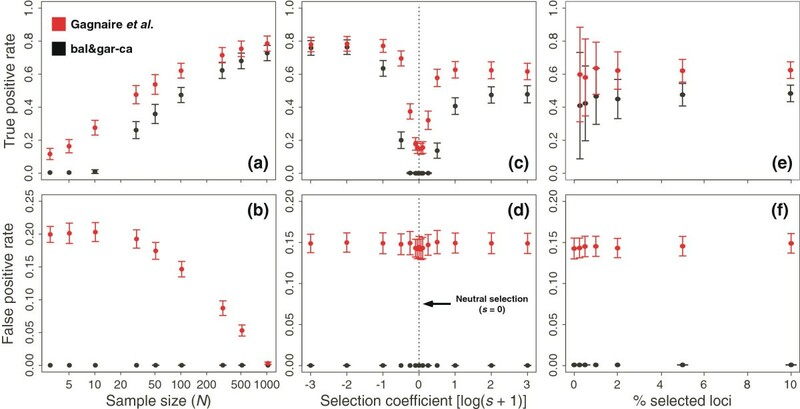 In the second approach we compared specifically our method with Gagnaire et al.’s and we tested the effect of the sampling bias, selection coefficient and percentage of loci under selection on the detection of outliers. A range of possible scenarios were run regarding: (i) different parental sampling sizes (3, 5, 10, 30, 50, 100, 300, 500 and 1000 individuals, from the original populations of 1000 individuals each) for a s = 99 [log (s + 1) = 2]; (ii) different values of the selection coefficient (-0.999, -0.990, -0.900, -0.684, 0.000, 2.162, 9.000, 99.000 and 999.000; equivalent to log (s + 1) values of -3.00, -2.00, -1.00, -0.50, -0.25, -0.10, -0.05, 0.00, 0.05, 0.10, 0.25, 0.50, 1.00, 2.00 and 3.00, respectively) with a parental sampling of 100 individuals each (from the original populations of 1000 individuals each); (iii) different proportions of selected loci from the 1000 simulated ones (0.0%, 0.5%, 1.0%, 5.0% and 10.0%). Every scenario was replicated 100 times. Results (Figure 1) showed, on the one hand, that the bal&gar-ca method was very conservative and that its sensitivity (i.e., the rate of true positives) was lower than Gagnaire et al.’s. However, the bal&gar-ca method had a null false positive rate unlike Gagnaire et al.’s (~15% false outlier detection). Regarding the sampling bias (affecting the estimates of parental frequency), although the sensitivity (Figure 1a) of the bal&gar-ca method is specially lower than Gagnaire et al.’s at low sample sizes (i.e. with a high deviation in the parental frequency estimates), in these cases Gagnaire et al.’s suffers from a much higher false positive rate (Figure 1b). Both methods behave in a similar way in relation to varying selection coefficients and percentage of selected loci (Figure 1c–f). In our simulation, the sensitivity of both methods decreases at low values of the selection coefficient. Although detection of loci under selection becomes null in the bal&gar-ca method, its rate of false positives is null as well. Otherwise, the type I error rate of Gagnaire et al.’s method remains about 15% regardless of the selection coefficient values. Lastly, the mean rates of true and positive values obtained by both methods are not affected by the percentage of selected loci (Figure 1e–f). However, when the percentage of selected loci increases, the standard deviation of the sensitivity values decreases. Effect of the parental sample size ( N ) on (a) the detection of true outlier loci and (b) rate of false positives, for the two methods. Influence of the selection coefficient (s) on (c) the detection of true outlier loci and (d) rate of false positives. Effect of the percentage of selected loci on (e) the detection of true outlier loci and (f) rate of false positives. Simulations (N =100) were performed for 900 neutrally introgressed loci and 100 loci under selection for Gagnaire et al.’s (in red) and bal&gar-ca (in black) methods. Bars for ± standard deviation values. The original formulation of Gagnaire et al.’s and bal&gar-ca methods use the square-root method to estimate the null-allele frequency. As the allele frequency estimation is difficult in dominant markers, we investigated the effect on the outlier detection of using a Bayesian estimator of the null-allele frequency, q ^ , with non-uniform priors . For the bal&gar-ca method, we also modified the calculation of the frequencies of the parental allele confidence intervals, by using a quantile-based 95% probability interval based on the Bayesian estimator of the squared standard error, s q ^ 2 . To compare this Bayesian method and the previous approach for a particular common scenario, 900 independent loci plus 100 selected loci (s = 99) were simulated in 100 F1 hybrid individuals from two parental populations (A and B) with 100 individuals each. One hundred simulations were carried out to compare the results of both methods (Gagnaire et al.’s and bal&gar-ca) with both different allelic frequencies estimation (square-root and Bayesian). Figure 2 shows the results for different allelic frequency estimates in the two genome scan methods. Bayesian estimation has strong effect in both methods. 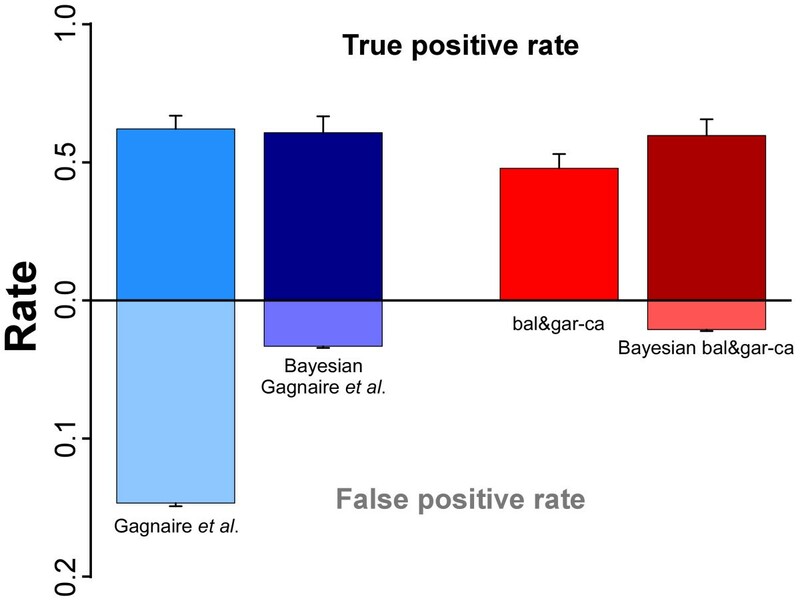 For Gagnaire et al.’s method, using Bayesian estimations slightly decreased its sensitivity, but it highly decreased its rate of false positives (from 15% to 4%). For the bal&gar-ca method, using Bayesian estimations improved its sensitivity, but its rate of false positives also increased (reaching almost 3% –which, nevertheless, was not very high). Effect of the allele frequency estimation method (square-root and Bayesian estimations –non-labelled and labelled columns, respectively) on the detection of true outlier loci and rate of false positives for Gagnaire et al. ’s and bal&gar-ca methods. Bars for the standard deviation. In stable hybrid zones with several generations of hybrids, introgress seems to be a compromise solution. However, in transitory recent hybrid zones, bal&gar-ca and Gagnaire et al.’s methods are better options, depending on the size of the hybrid zone, our sampling strategy and the scope of the genome scan. Gagnaire et al.’s is useful when we have a good population sampling. However, when the sample sizes are modest and we want to avoid any possible false positive, bal&gar-ca is the advised method. Although Bayesian estimation of frequency allele has been proved to be useful in many cases, it is not advised for the bal&gar-ca method as it increases its type I error rate. Finally, none of these methods is advisable when the selection coefficient shows low values, which is not strange as, in these cases, long periods of time would be needed to accumulate detectable signal in the DNA . In this example, we carry out the simulation of two parental populations of 100 individuals and 100 F1 hybrids for a total of 300 markers using the ‘hybridsim’ function. Positive selection was simulated with s = 10 for 15 out of 300 markers. Firstly, we need to load AFLPsim and set the random seed number (arbitrarily to 123) for reproducibility. This is an object ‘hybridsim’ that contains the presence-absence matrices for the parentals (PA and PB) and for the hybrid classes (in this case, F1). In addition, this object contains the loci under selection (f1hybrid$SelMarkers) and the selection coefficient used in the simulation (f1hybrid$S). Then we perform a genome scan with the bal&gar-ca method setting the type parameter to the correct hybrid class (i.e. F1 hybrids). The results of the genome scan analysis are saved in a data object (outlier), which includes the P-values of the binomial test after FDR (outlier$fdrf1), and the loci identity of those markers with P < 0.05 (outlier$Outliers). Moreover, this object is used as the input for the ‘plot.hybridsim’ function to generate a plot of the outlier markers and the expected frequencies under neutrality (Figure 3). Three-dimensional scatter plots showing significant outlier loci detected by the ‘gscan’ function for the simulated F 1 hybrids. 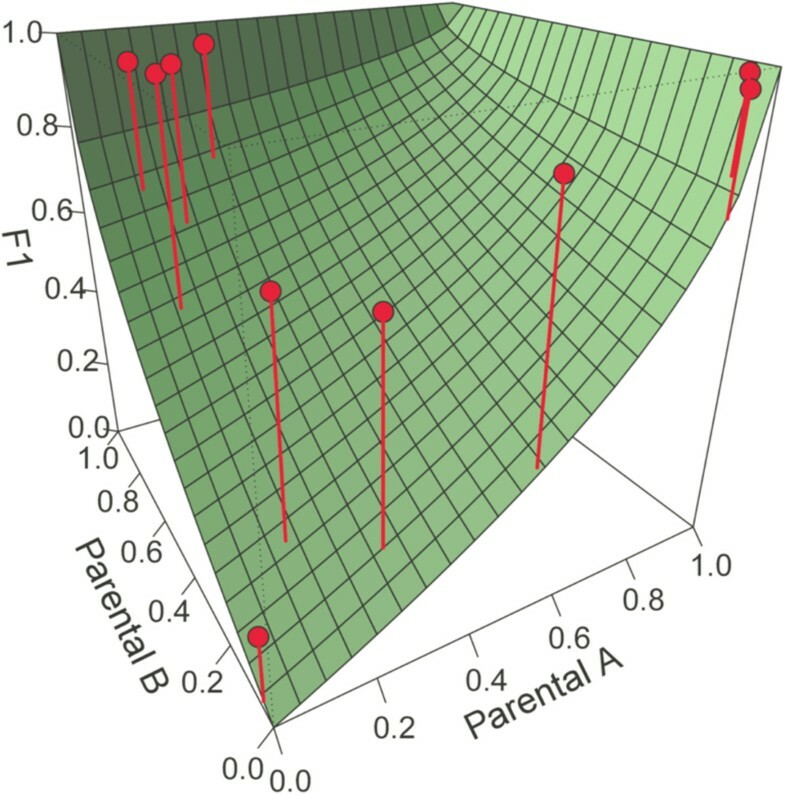 The green-coloured surface shows the theoretical probability of observing a dominant marker as a function of the band presence frequency in each parental species. The difference between the observed and the theoretical band frequency is represented with a vertical line joining both values. In this example, we detected 10 out of 15 loci under selection (67% sensitivity) and we did not obtain any false positive. Finally, we simulated hybridization on one area and evaluated its demographical consequences. For the initial frequencies we created a vector with the frequencies of Parental A, Parental B, F1, Backcross to Parental A, Backcross to Parental B and Fx. In our case, we fix Parental A and Parental B initial frequencies to 0.5. Then, we create a matrix of assortative mating using the matrix function, and allow crosses between all taxa with the same probability. Simulated demographic evolution of a hybrid zone under similar initial proportions of the parentals, using a modified version of Epifanio & Philipp's model. Each bar represents the relative proportion of each parental and hybrid category (see legend) in the area over 8 generations (G0-G8), until Parental A (PA) dominates the area. This simulation study showed the interest of performing comparative studies in hybridization analytical software. Here we fill an important gap in this kind of software, as the R package AFLPsim application provides several useful tools in the context of hybridization studies. This is true specifically in relation to dominant markers with low sample sizes, in order to obtain markers under selection with a low rate of false positives and with a rather high sensitivity. None of the methods used is advisable when the selection coefficient shows low values. Moreover, AFLPsim provides a demographic method to study evolution in this context. Finally, we hold an on-going project to implement the bal&gar-ca method with biallelic codominant markers as well as single nucleotide polymorphisms (SNPs). We thank Dr. M. Escudero for help in the ‘demosimhybrid’ code, for testing the software and providing feedback. Dr. O. Paun and two anonymous reviewers provided invaluable comments on a previous version of the manuscript. While working on this package, FB was partly funded by a Marie Curie Intra-European post-doctoral fellowship (‘TRANSADAPTATION’) at the Department of Systematic and Evolutionary Botany (University of Vienna) and Junta de Andalucía, Proyecto de Excelencia (2005/RNM484) and Ministerio de Educación y Ciencia, Flora iberica VIII (CGL2009-08178) and Flora iberica IX (CGL2012-32914), which were financed by FEDER funds. FB and JLG-C developed and coded the R package AFLPsim. FB drafted the manuscript and JLG-C assisted in drafting the manuscript. Both authors read and approved the final manuscript.